Homemade blueberry pie provides the perfect finale to a 4th of July celebration or any other occasion. Bursting with fresh blueberries and topped with a simple star-studded crust, our easy Blue Sky Blueberry Pie recipe is an all-American pick for your 4th of July dessert table: pretty, patriotic and oh-so-good! Dig in and wear the blueberry mustache as a badge of good taste! To make the filling: Wash and de-stem blueberries and put into saucepan. Sprinkle with the sugar, 4 tablespoons of flour and cinnamon. Then stir until the blueberries are coated with the dry ingredients. Cut the lemon into squeezable fourths. Squeeze the lemon juice from each slice onto the blueberries (watch for seeds or remove lemon seeds before squeezing). Add a ½ cup of water and stir until coated. Turn the burner heat on low and stir frequently until the blueberry syrup begins to slightly bubble. Do not let it come to a full boil. Remove from heat and set aside. To make the bottom crust: Sprinkle a little flour onto your clean work surface. Roll the dough an inch larger than your pie pan (Tip: Turn your pie pan upside down, lay it on top of the dough and trim the edge). Press the pie dough firmly into the bottom of the pan working your way up to the edge. Trim dough again if necessary. Set aside. To make the top crust: Sprinkle a little more flour onto your now doughy work surface. Roll out the second piece of dough just as you did the first. For our sky design: Cut 6 to 12 stars, depending on the cookie cutter. Partially cover the filling with the stars so the color of the fruit peeks through. Using a slotted mixing spoon, scoop the blueberry mixture into the bottom piecrust. Not all the berry syrup is necessary. If you use it all, it might bubble over, so leave a little in the pan. Cut the butter into pieces and scatter on top of the blueberry filling. Gently use a spatula to pry top decorations from your work surface. Lay them on the filling. Brush with milk. Reduce oven temperature to 350˚F, and bake for 45 minutes or until crust turns golden brown and the filling bubbles. Let cool completely before serving. *If frozen, thaw the pie dough according to packaging, but keep your thawed dough in the refrigerator while creating the filling. Tip: Set the pie on a cookie sheet before baking in case it bubbles over in the oven. 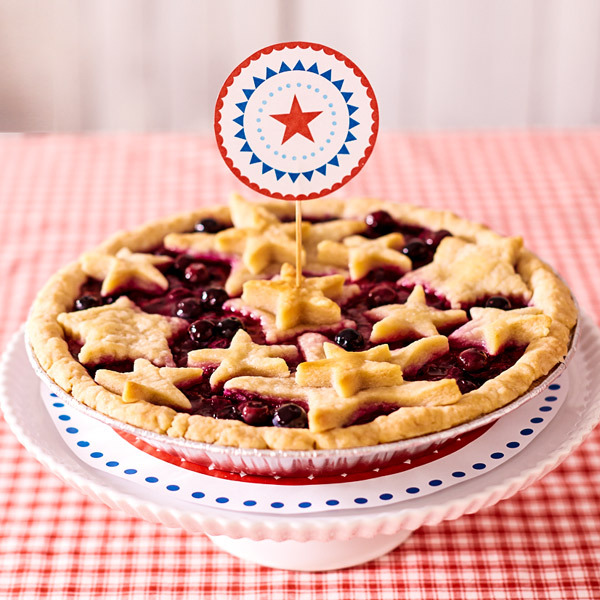 You can make our Stars-and-Stripes Strawberry Pie with this same recipe. Just switch the fruit to 4 cups of de-stemmed and sliced strawberries and update the top crust decorations.